Plants will grow relative to the size of their containers. Choosing the pot determines how large the plant will get, and adopting a similar approach to your business will lead to healthy sales growth as well. How can we as sellers root ourselves in the best environment possible to flourish? Any gardener will tell you the secret to a thriving garden is good soil with plenty of space, proper maintenance, and some super powered fertilizer. LinkedIn is the soil needed for sales development. Decision makers inform themselves about their sales person and learn about the vendor on LinkedIn, often before we are involved in the conversation. 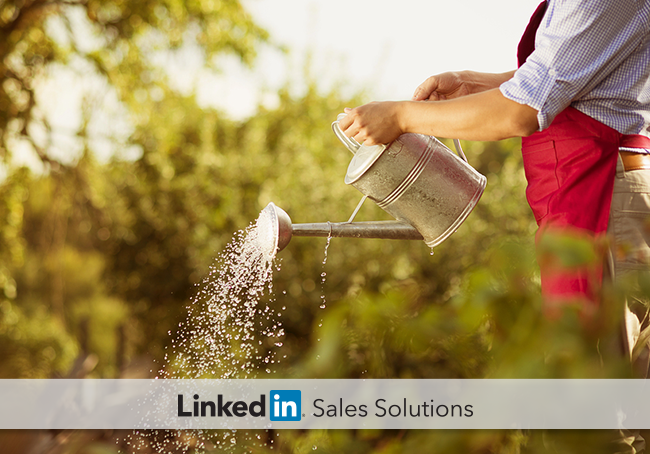 Planting yourself in LinkedIn’s network positions you among your buyers with space to sprout. Social Selling on LinkedIn has reshaped the way we approach sales, making it an effective place for sales people to engage on a daily basis. The soil contains key nutrients for sales health such as an enormous opportunity for new connections, up-to-date information on people in our networks, and the ability to stay relevant among prospects. You are planted in the right place. How do you grow? When you purchase a plant you promise yourself that you will water it, place it in the proper amount of sunlight, and care for it so it can grow big and strong. Invest in yourself and your team to help them achieve the same. But, choosing the right soil isn’t enough; you have to stay active and engaged to squeeze all the richness out of what those nutrients provide. How do we do this on LinkedIn? Subscribing to some best practices will provide the care needed to mature as a social seller. Lead with insights when contacting a prospect. Connect on their recent activity on LinkedIn or something relevant to a detail or interest on their profile. Stay relevant by sharing content thoughtfully in posts, articles, and the publishing tool. Your profile is your business card and often times the first impression people will have of you. A fully flushed out profile should highlight your expertise, showcase your company’s strengths, and give your network the chance to relate to you on a personal level. Your summary tells someone a lot about you. Talk about yourself as a human and as a professional- this will go a long way. Keep expanding your network and connecting with people you meet. This will only make you stronger! Sales Navigator is the Miracle-Gro of LinkedIn. Supercharge yourself and your team. LinkedIn Sales Navigator enables sales professionals to build pipeline, create new opportunities, and spread wider among current clients. The most successful sales teams are adopting a social selling approach with this platform. The strategy is centered on finding the right people at target accounts, leading with insights by staying informed on updates within your network, and building trusts with key prospects. This is the secret formula that has led to incredible sales growth among companies who have adopted LinkedIn for their sales process. At LinkedIn our job is to help people bloom as professionals. The most successful sales organizations leave room to expand. LinkedIn thrives in a culture of dreaming big and filling that empty space with what is necessary to reach the goal, and we seek to help our members experience the same.